Militancy in Kosovo emerged in 1995, following the Dayton Agreement. 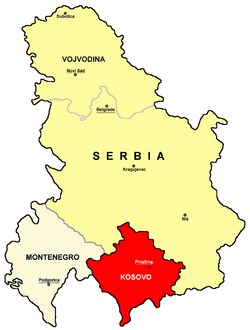 Kosovo Albanians had proclaimed the Republic of Kosova on September 22, 1992, and sought recognition in the Dayton Agreement. In 1996, the Kosovo Liberation Army (KLA) took responsibility for terrorist attacks, targeting ethnic Serb villages and Serbian governmental buildings and police stations. The KLA was funded by the diaspora and drug trafficking, and received a large amount of arms following the Albanian civil war. The insurgency led to the Kosovo War in March 1998. From 1991 to 1992, Albanian nationalist Adem Jashari and about 100 other ethnic Albanians wishing to fight for the independence of Kosovo underwent military training in the municipality of Labinot-Mal in Albania. Afterwards, Jashari and other ethnic Albanians committed several acts of sabotage aimed at the Serbian administrative apparatus in Kosovo. Attempting to capture or kill him, Serbian police surrounded Jashari and his older brother, Hamëz, at their home in Prekaz on 30 December 1991. In the ensuing siege, large numbers of Kosovo Albanians flocked to Prekaz, forcing the Serbs to withdraw from the village. While in Albania, Jashari was arrested in 1993 by the government of Sali Berisha and sent to jail in Tirana before being released alongside other Kosovo Albanian militants at the demand of the Albanian Army. Jashari launched several attacks over the next several years. These targeted the Yugoslav Army (VJ) and Serbian police in Kosovo. A Serbian policeman was killed in 1995, allegedly by the KLA. Since 1995, the KLA sought to destabilize the region by terrorism acts, hoping the United States and NATO intervene. Serbian patrols were ambushed and policemen killed. It was only in the next year that the organization of KLA took responsibility for attacks. The KLA, originally composed out of a few hundred Bosnian War veterans, Muslims Albanians, attacked several police stations and wounded many police officers in 1996–97. In 1996 the British weekly The European carried an article by a French expert stating that "German civil and military intelligence services have been involved in training and equipping the rebels with the aim of cementing German influence in the Balkan area. (...) The birth of the KLA in 1996 coincided with the appointment of Hansjoerg Geiger as the new head of the BND (German secret Service). (...) The BND men were in charge of selecting recruits for the KLA command structure from the 500,000 Kosovars in Albania." Former senior adviser to the German parliament Matthias Küntzel tried to prove later on that German secret diplomacy had been instrumental in helping the KLA since its creation. KLA representatives met with American, British, and Swiss intelligence agencies in 1996, and possibly "several years earlier" and according to The Sunday Times, "American intelligence agents have admitted they helped to train the Kosovo Liberation Army before NATO's bombing of Yugoslavia". Intelligence agents denied, however, that they were involved in arming the KLA. In February 1996 the KLA undertook a series of attacks against police stations and Yugoslav government officers, saying that the Yugoslav authorities had killed Albanian civilians as part of an ethnic cleansing campaign. Serbian authorities denounced the KLA as a terrorist organization and increased the number of security forces in the region. This had the counter-productive effect of boosting the credibility of the embryonic KLA among the Kosovo Albanian population. On 22 April 1996, four attacks on Serbian security personnel were carried out almost simultaneously in several parts of Kosovo. Jashari was convicted of terrorism in absentia by a Yugoslav court on 11 July 1997. Human Rights Watch subsequently described the trial, in which fourteen other Kosovo Albanians were also convicted, as "[failing] to conform to international standards." The Albanian civil war of 1997 ennabled the KLA to acquire large amounts of weapons looted from Albanian armories. An 1997 intelligence report stated that the KLA received drug trafficking proceeds, used to purchase arms. According to the report of the U.S. Committee for Refugees the KLA attacks "aimed at trying to 'cleanse' Kosovo of its ethnic Serb population". The Yugoslav Red Cross had estimated a total of 30,000 refugees and internally displaced persons (IDPs) from Kosovo, most of whom were Serb. The UNHCR estimated the figure at 55,000 refugees who had fled to Montenegro and Central Serbia, most of whom were Kosovo Serbs: "Over 90 mixed villages in Kosovo have now been emptied of Serb inhabitants and other Serbs continue leaving, either to be displaced in other parts of Kosovo or fleeing into central Serbia." The NATO North Atlantic Council had stressed that KLA was "the main initiator of the violence" and that it had "launched what appears to be a deliberate campaign of provocation". James Bissett, Canadian Ambassador to Yugoslavia, Bulgaria and Albania, wrote in 2001 that media reports indicate that "as early as 1998, the Central Intelligence Agency assisted by the British Special Air Service were arming and training Kosovo Liberation Army members in Albania to foment armed rebellion in Kosovo" with the hope that "NATO could intervene (...)". Pursuing Adem Jashari for the murder of a Serbian policeman, Serbian forces again attempted to assault the Jashari compound in Prekaz on 22 January 1998. With Jashari not present, thousands of Kosovo Albanians descended on Prekaz and again succeeded in pushing the Serbian forces out of the village and its surroundings. The next month, a small unit of the KLA was ambushed by Serbian policemen. Four Serbs were killed and two were injured in the ensuing clashes. At dawn on 5 March 1998, the KLA launched an attack against a police patrol in Prekaz, which was then answered by a police operation on the Jashari compound which left 58 Albanians dead, including Jashari. Four days after this, a NATO meeting was convoked, during which Madeleine Albright pushed for an anti-Serbian response. NATO now threatened Serbia with military response. The Kosovo War ensued, with subsequent NATO intervention. The KLA launched 31 attacks in 1996, 55 in 1997, and 66 in January and February 1998. After the KLA killed four policemen in early March 1998, special Serbian police units retaliated and attacked three villages in Drenica. The Kosovo War ensued. The total number of attacks in 1998 was 1,470, compared to 66 the year before. Between 1991 and 1997, mostly in 1996–97, 39 persons were killed by KLA. Attacks between 1996 and February 1998 led to the death of 10 policemen and 24 civilians. ↑ Judah 2002, p. 111. 1 2 3 Bartrop 2012, p. 142. ↑ Pettifer & Vickers 2007, p. 113. ↑ Pettifer & Vickers 2007, pp. 98–99. 1 2 3 Professor Peter Radan; Dr Aleksandar Pavkovic (28 April 2013). The Ashgate Research Companion to Secession. Ashgate Publishing, Ltd. pp. 178–. ISBN 978-1-4094-7652-8. 1 2 3 4 5 Marsden 2000. ↑ Kushner 2002, p. 206. ↑ Küntzel, Matthias (2002): Der Weg in den Krieg. Deutschland, die Nato und das Kosovo (The Road to War. Germany, Nato and Kosovo). Elefanten Press. Berlin, Germany. pp. 59–64 ISBN 3885207710. 1 2 Judah 2002, p. 120. ↑ Tom Walker; Aidan Laverty (12 March 2000). "CIA aided Kosovo guerrilla army". London: The Sunday Times. ↑ "Unknown Albanian 'liberation army' claims attacks". Agence France Presse. 17 February 1996. ↑ Human Rights Watch 1998, p. 27. ↑ A. Pavkovic (8 January 2016). The Fragmentation of Yugoslavia: Nationalism and War in the Balkans. Springer. pp. 190–. ISBN 978-0-230-28584-2. ↑ Nicholas Ridley; Nick Ridley (1 January 2012). Terrorist Financing: The Failure of Counter Measures. Edward Elgar Publishing. pp. 46–. ISBN 978-0-85793-946-3. ↑ Roland Keith (May 1999). "Failure of Diplomacy, Returning OSCE Human Rights Monitor Offers A View From the Ground in Kosovo". The Democrat. 1 2 Allan, Stuart; Zelizer, Barbie (2004). Reporting war: journalism in wartime. Routledge. p. 178. ISBN 0-415-33998-7. ↑ Elsie 2011, p. 142. ↑ Judah 2002, p. 140. 1 2 3 Carrie Booth Walling (1 July 2013). All Necessary Measures: The United Nations and Humanitarian Intervention. University of Pennsylvania Press. pp. 156–. ISBN 978-0-8122-0847-4. ↑ James Ron (19 April 2003). Frontiers and Ghettos: State Violence in Serbia and Israel. University of California Press. pp. 98–. ISBN 978-0-520-93690-4. Mikael Eriksson; Roland Kostić (15 February 2013). Mediation and Liberal Peacebuilding: Peace from the Ashes of War?. Routledge. pp. 43–. ISBN 978-1-136-18916-6. Human Rights Watch (1998). Humanitarian Law Violations in Kosovo. New York: Human Rights Watch. ISBN 978-1-56432-194-7. Judah, Tim (2008). Kosovo: What Everyone Needs to Know. New York: Oxford University Press. ISBN 978-0-19-974103-8. Harvey W Kushner (4 December 2002). Encyclopedia of Terrorism. SAGE Publications. pp. 206–. ISBN 978-1-4522-6550-6. Luci, Nita; Marković, Predrag (2009). "Events and Sites of Difference: Marking Self and Other in Kosovo". In Kolstø, Pål. Media Discourse and the Yugoslav Conflicts: Representations of Self and Other. Farnham, England: Ashgate. ISBN 978-1-4094-9164-4. O'Neill, William G. (2002). Kosovo: An Unfinished Peace. Boulder, Colorado: Lynne Rienner Publishers. ISBN 978-1-58826-021-5. Perritt, Henry H. (2010). The Road to Independence for Kosovo: A Chronicle of the Ahtisaari Plan. New York: Cambridge University Press. ISBN 978-0-521-11624-4. Petersen, Roger D. (2011). Western Intervention in the Balkans: The Strategic Use of Emotion in Conflict. New York: Cambridge University Press. ISBN 978-1-139-50330-3. Pettifer, James (2005). Kosova Express: A Journey in Wartime. Madison, Wisconsin: University of Wisconsin Press. ISBN 978-0-299-20444-0. Pettifer, James; Vickers, Miranda (2007). The Albanian Question: Reshaping the Balkans. New York: I.B. Tauris. ISBN 978-1-86064-974-5. Philips, David L. (2012). Liberating Kosovo: Coercive Diplomacy and U.S. Intervention. Cambridge, Massachusetts: MIT Press. ISBN 978-0-262-30512-9. Watson, Paul (2009). Where War Lives. Toronto: McCleland & Stewart. ISBN 978-1-55199-284-6. Mark Bromley (2007). "Case study: Federal Republic of Yugoslavia, 1998–2001" (PDF). Stockholm International Peace Research Institute.